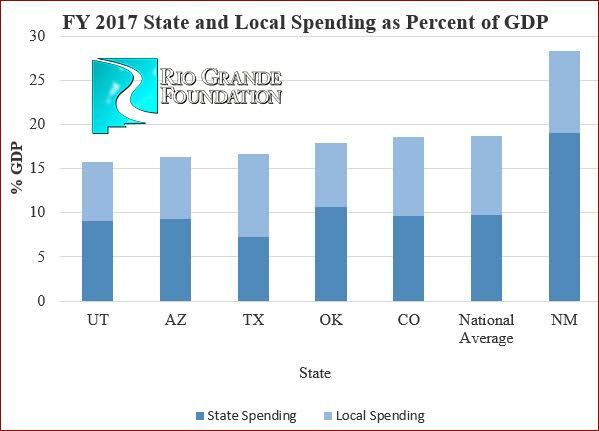 As the Democrat-controlled Legislature whines about spending cuts and attempts to raise taxes, newly-released 2017 data show New Mexico state/local spending (as a percentage of gross state product) far outpaces neighbors and is 2nd-highest overall. The data are from USGovSpending.com. Only Kentucky spends more as a percent of economic output than New Mexico. If I remember correctly, the former city manager wrote in his newsletter that Las Cruces politicians needed $70 million to offset the loss of the state hold harmless money over 15 years or so. Then they passed a $140 million tax increase and it looks like they have been trying to spend or otherwise hide their embarrassment of riches since then. The auditors say they are in good financial shape though. I would think so. Note that in the chart above, the local spending is not so very different from that of the surrounding states and the national average. But the STATE spending (darker blue) is about double that of the surrounding states and the national average. The state really has a need to rein in its spending, but that probably won’t happen with the Democrats in charge in both the House and the Senate. To be completely fair, NM does its education spending at the state level whereas many states do it at the local level, but the fact is that NM’s government is too large given our poor economy. I suspect these state spending figures include state-administered federal dollars e.g. medicaid and highways. It may be valid to include these, but I think the inclusion should be disclosed, since most discussions of state spending exclude them.